One of my favorite menu items at Thai restaurants is Coconut Ginger soup. In case you've never had it, it is a creamy, coconut based soup full of vegetables like baby corn and mushrooms as well as traditional Thai flavors like lime leaves, lemongrass and ginger. It is really tasty and incredibly filling compared to most soups, I think, because of the strong coconut taste (and of course the fat which the coconut contributes). Given that it is a creamy soup, I rarely actually order this soup when I go to a Thai restaurant (even though I absolutely love it!) unless it is a special occasion. I've always wanted to make my own low calorie coconut ginger soup and I assure you it is on my backlog of recipes that I will create soon. 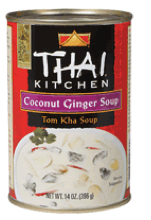 In the interim, though, I recently found this delicious Coconut Ginger Soup at Whole Foods made by Thai Kitchen. It really hits the mark for me! One serving of the Thai Kitchen Soup (half of the container) is 200 calories, 13 grams of fat (from the coconut), and 1 gram of fiber -- so 5 weight watchers points. It is also gluten-free. When I make this soup, I usually add some additional baby corn (it is a bit light on it and I love baby corn), broccoli, as well as some water chestnuts (I can blog about water chestnuts soon if you are unfamiliar -- let me know), in order to create what I find to be a completely satisfying and filling lunch or dinner. PS. Thai Kitchen also makes a delicious and easy-to-make low calorie Pad Thai that is worth checking out if you like Thai food. I'm going to check out the Pad Thai for Ben. I bet he'd like it. Oh that is one of my favorite canned soup! I posted on it in my earlier blog I was surprised at how good it tasted! You are a goddess! I've seen Thai Kitchen around, but always stayed clear, cynically assuming they were just like A Taste of Thai. Thank you for showing me my embittered ways and turning me towards the light of Thai! Coconut soup, here I come!